The natural color enhancing ingredients produce natural brilliant colors in a relatively short period of time. A high protein,porous stick that immediately becomes soft and sponge-like when fed. The food is easily digested and will not crumble or fall apart even during your Discus unusual eating routine of repeatedly taking the food in and spitting it out. This helps reduce water quality problems and clouding which is customary with other foods. Made from a perfect blend of proteins,indispensable amino acids,necessary vitamins and selected minerals. 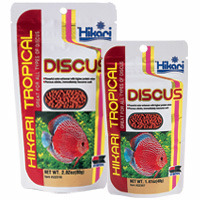 For unequalled and extremely healthy growth rates feed Hikari Tropical Discus.